There’s a new pattern in the Crochet Spot Store! 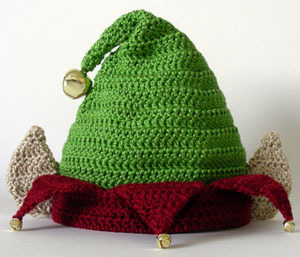 This elf hat pattern comes in 5 different sizes from baby to adult. Dress up as a cute elf this Christmas to show your holiday spirit! The hat is crocheted in the round from the top down. It’s decorated with multiple bells, to create the most noisy and fun hat you’ll ever wear. Elf ears are also crocheted and sewn onto the hat to make you as elf like as possible. This entry was posted on Sunday, November 20th, 2011 at 12:00 AM by Rachel Choi	and is filed under Best Crochet Patterns. You can follow any responses to this entry through the RSS 2.0 feed. You can leave a response, or trackback from your own site.